"It is my first time meeting fans directly through twitter. It was really fun!" Sorry HyungJun. We didn't realise that he is such like a world star. SS501 Kim HyungJun came to the MaeKyung Media Centre located in ChungMuRo, Seoul on 9-Dec morning to find StarToday and had his twitter interview. Even though we somehow we felt sorry for getting Kim HyungJun to spend time for this since he is busy with musical 'café-in' recently, we felt relieved that he was enjoying the different flavor of meeting with fans. After the notice of twitter interview with Kim HyungJun was made, there have been visitors from all over the world coming to StarToday (twitter). Even though we cannot do it together, they did their own English translations, doing their best and we can feel the fans' affection for SS501 members as warm as ever. On this day for Kim HyungJun's twitter interview, fans from all over the world joined, including our country Korea, Asia regions, Argentina, Mexico, Saudi Arabia, Greece, Brunei, Peru, Turkey, etc. Flooded with fans¡¯ questions in real-time, Kim HyungJun was no doubt, shocked by it but handled it well with his unique groundless confidence. 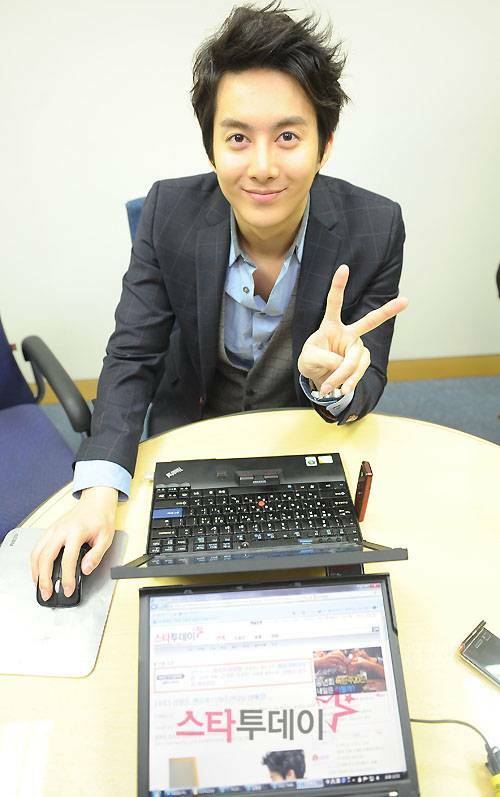 "Person with appearance for Arab world" Kim HyungJun replied fans with a faster typing speed than expected and grinning ear to ear. Nearing to the end of the interview, he rolled up his sleeves and left us an impression for the interview. In the 50 minutes of limited time, the 'explosive' twitter interview with Kim HyungJun was explosive to a regretful extent. Well, what stories came out in the interview? Hello~^^ I am here~ This is the very perfect man Kim HyungJun!!!!!!!!!! @mkstartoday All the members (excluding JungMin) held fan meeting, don¡¯t you have plans for fan meeting in Korea?? And what is your future plans?? @mkstartoday Do you contact the members often??? @mkstartoday 1 year later, you will be 25 years old, is there anything you must do when you become 25? @youngjinmam Next year, solo album and drama!!?? @mkstartoday You look very awkward with the actress when shooting for the poster, how did you become close to actress Shin EuiJung? Is it because you have such great sociability that you can become close with other actors immediately? @mkstartoday What is the source for HyungJun¡¯s unique great sociability + infinite positivity? @suyeong84 That is none other than,,,, Everyone~>? ?^^ Isn¡¯t it confidence!?!?!?!?!??!?!!??! @novalyamo Thank you to fans living in Turkey! Till then when I can go and have performance in Turkey soon!! @mkstartoday Do you know that in Russia there are many people who likes you? fighting! And don't forget to have a rest! @JuWon_8863 Our members~! Especially JungMin! @StaR0828 I love Sora~ Peace! @mkstartoday will hyung jun come to singapore again? @mkstartoday HyungJun oppa^^ What is your new year resolution? @betterlily I will come out with a solo album and several other! @kikiaijun It's okay! Work hard and try to converse in Korean! Hwaiting! @mkstartoday Favorite song of ss501? @mkstartoday I definitely want to have a date like this! If you have a chance for this, what kind of date will it be?? @jina_me She is resting at home~ Princess Choco! @mkstartoday You are indeed good Kim HyungJun!! @icejji You know it now~? @mkstartoday Do you know in PeulKa is KyeoTeol JjaJangMyeon? @yakultmilo Of course I want to! When I start my activities next year, go go! @mkstartoday COME TO GREECE!!! Opaa we have SOUVLAKI!! Please!!! @alwaysmilingly I am good at cooking cup ramyun! @mkstartoday Why is there not much of HyungJun's replies? Quickly quickly dilligently reply us. @mkstartoday You are the very first one among SS501 members to start twitter, what do you think is the attraction of twitter? And do you check fans' mentions in your free time? @Snowday0507 What can I say~ Because I am a man! @mkstartoday I skipped shool so my teacher called me TT TT What should I do?!!! @SoYoung96 Go and get scolded. How can you do that!!! Why skip school!!! @mkstartoday Jjun oppa, what are you doing on Christmas? @mkstartoday do you know about fans in Argentina (southamerica)? @seeso4 Thank you, Saudi Arabia!!!! @mkstartoday HyungJun oppa Do you know where is Brunei? If you have a chance, will you come??? @mkstartoday COME TO ENGLAND SOON! There are Triple S here Too!!! @mkstartoday Is there plan to hold fan meeting in Japan?? @malioct27 Will see you very frequently next year! @mkstartoday How do you feel when fans scream when they see you? @mkstartoday Is there anything else you want to use besides blackberry? I am using iphone 4. @nongpomx Thank you. I will see Thailand soon! @Aloefarm64 Another 20 minutes more! Talk to your heart's content! @junvirus Quickly quickly send in your questions! @mkstartoday Your acting is improving. How much will you give on your acting skills? @mkstartoday Don't you miss USA fans??!!? Please reply me!! I am now working hard translating your tweets!!' real-time!!! @Quainte501 I miss you~ I will go soon if you keep on supporting! @mkstartoday When will you start doing drama?? This is Kim HyungJun who has been conversing with you till now! It was fun~ In the future too, I will become a hardworking Kim Hyung Jun with even greater image. I love you! Peace!!!! I love you baby!